Doesn't everyone want a pair of slippers for Christmas? The Birchbark Slippers would make a wonderful gift for yourself or someone else. (I'm wearing mine right now.) 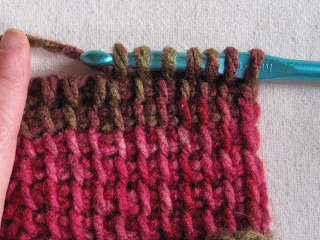 They stitch up quickly and are very straightforward: just an easy rectangle of Tunisian Simple Stitch. 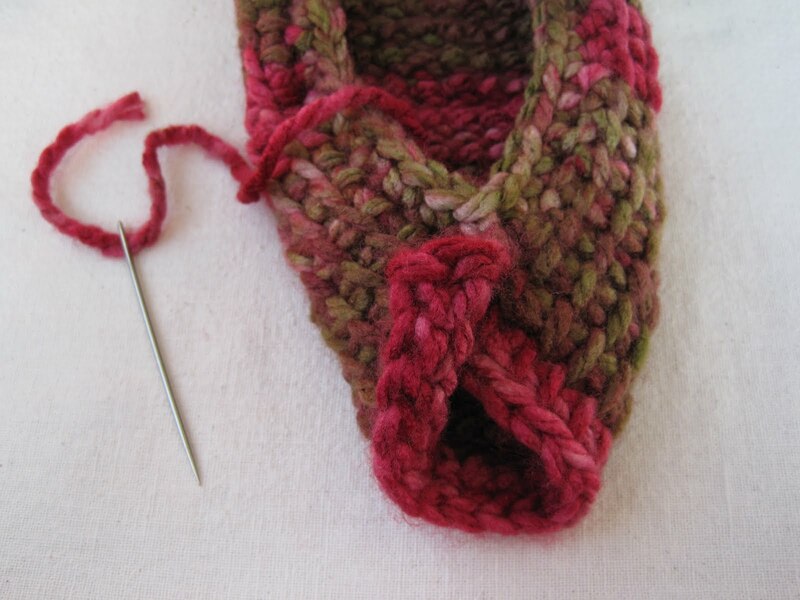 One end is seamed to create the heel, and the other end is folded to form the toe. Adornments are up to you and are limited only by your imagination. Because this pattern is customizable, the instructions may look a bit wordy. Don't let that put you off - this project is really very simple and quick. The hardest part is deciding how to embellish the slippers. 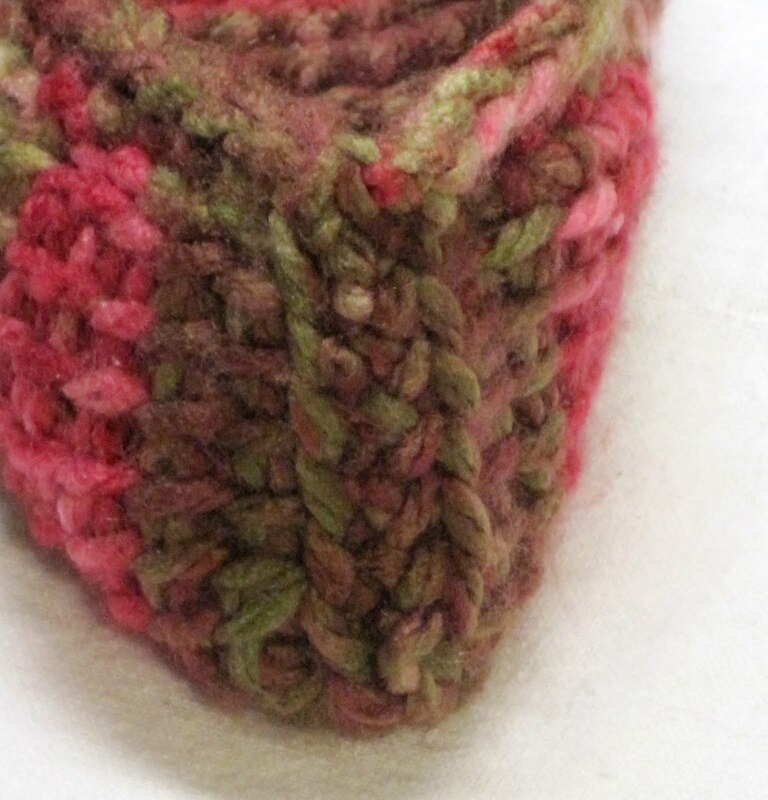 Adult slipper is made from a rectangle, 6" wide by 1" longer than the foot it's destined for. Children's slipper: I'd guess 5" wide for a child, and a bit smaller for a toddler. Trying the rectangle on the foot is the best method. If you're making gift slippers and you don't know how long the recipient's foot is, try to find out her shoe size. Then click here for a handy shoe size conversion chart. Bulky yarn, Size N hook - 18 stitches = approximately 6". 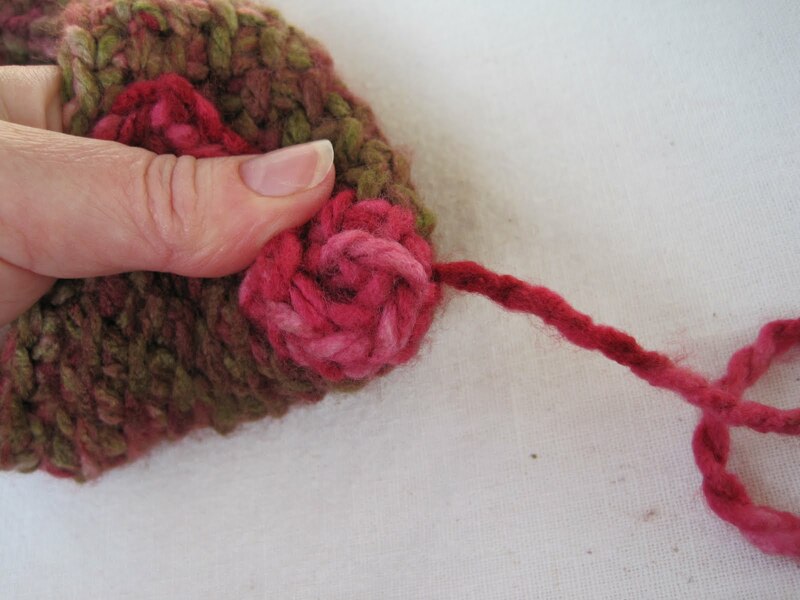 Super Bulky yarn, Size P hook - 14 stitches = approximately 6". This pattern is so simple, no chart is needed. and write the whole thing in plain English. The only abbreviation used will be Tss for Tunisian Simple Stitch. Make a rectangle in Tunisian Simple Stitch (or stitch of your choice), measuring 6" wide (or a width that will cover the bottom of your foot and come about halfway up the sides), by length of foot, + 1" (or whatever amount is necessary for a snug slipper). On last row, shape heel by making decrease of 2 stitches (or 3 if your rectangle is an odd number of stitches wide) in center of row. Bind off, then follow edging and assembly instructions below. 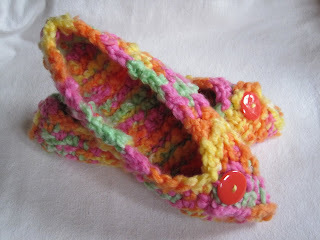 Numbers in parentheses refer to slipper made with Super Bulky yarn. Do not turn the work. This is the right side; keep it facing you at all times. The base row will become the toe of the slipper. 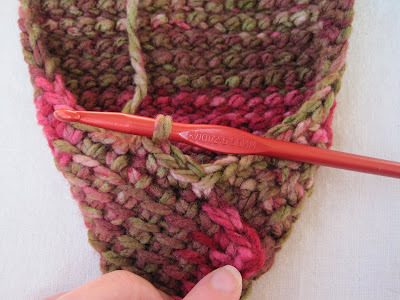 Return Pass: Yarn over, pull through 1 loop. *Yarn over, pull through 2 loops. Repeat from * until 1 loop left on hook. All return passes will be made like this one. drawn up and sitting on the hook. 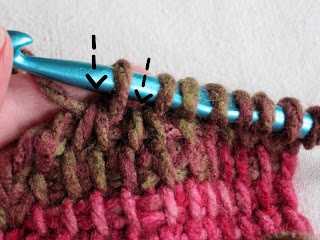 Regular Rows: Starting with second stitch, work Tss in each stitch across (Tunisian Simple Stitch - insert hook from right to left under vertical bar, yarn over, and draw up a loop). In last stitch, insert hook under vertical bar AND strand behind it. You should have 18 (14) stitches on the hook. Make return pass as above = 18 (14) stitches. 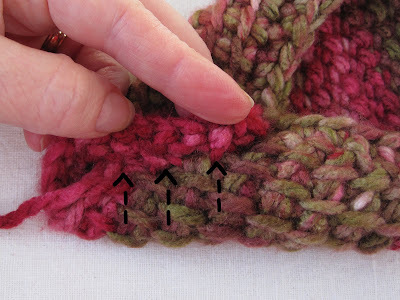 Adjust number of stitches as necessary to get proper width. Final row (decrease): Tss in 2nd vertical bar from hook AND next 5 (3) stitches. You should have 7 (5) loops on your hook. Tss 2 together (insert hook under next 2 stitches; draw up loop - decrease made). Make 1 more decrease (Tss 2 together), then Tss to end of row. Make return pass = 16 (12) stitches. adjust as necessary to place your decreases in the center of the final row. Change to size K hook for bulky yarn, or size N hook for super bulky yarn. 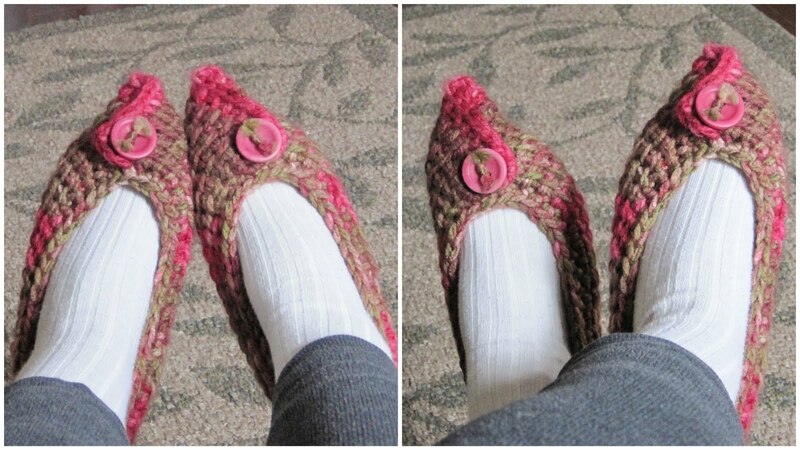 to crochet down the side of the slipper. Border: Chain 1. With right side still facing you, turn rectangle and work down the side. Single crochet 1 in each edge stitch until there are 3 stitches/rows left. Single crochet edging has been added to 1 side. Stop when there are 3 stitches left. Look at the opposite edge of the rectangle and find the 3rd row edge stitch. Overlap first side of rectangle (the one with the border) over the opposite side, aligning the 3rd row edge stitches. This will form the pointy toe. The corners of the rectangle now look like flaps - one on the inside and and one on the outside of the slipper. Note: You can join the front edges at any stitch you like - I pinned the tip of my slipper together and tried it on, and the 3rd rows seemed like a good joining place. Feel free to join the edges higher up, or even at different rows on either side, to get the best fit. 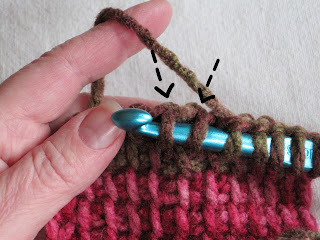 Insert hook in next edge stitch, AND 3rd edge stitch of opposite side. 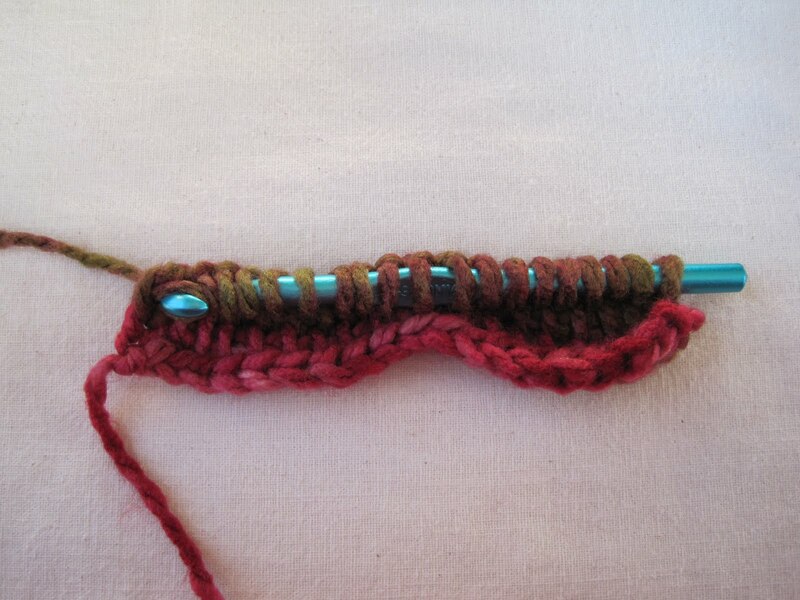 Single crochet both stitches together. so toe flaps will be mirrored when slippers are worn. 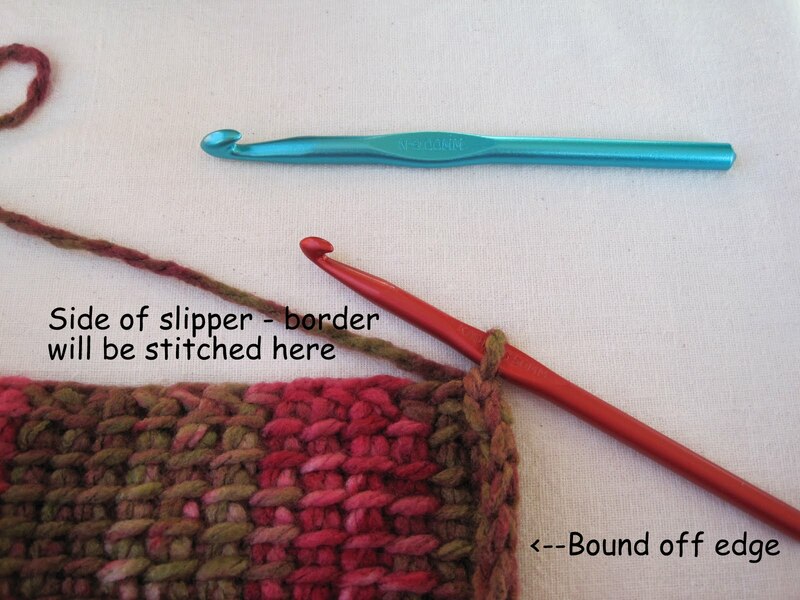 Now single crochet up the other side of the slipper, 1 in each edge stitch, until you reach the end. The right side of the work is still facing you. Stitching continues up the other side. Cut yarn, leaving a 12" tail. Pull yarn up through last stitch. Thread yarn on darning needle and whipstitch heel ends together from the outside. Hold the edges together for whipstitching. Stitch the very top stitches together first. the bottom of the heel. 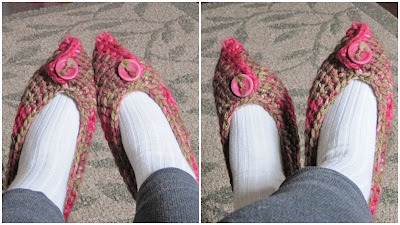 Hide yarn end in slipper and trim excess. Admire the neat heel with its little ridge of stitches and the zigzagging seam between. 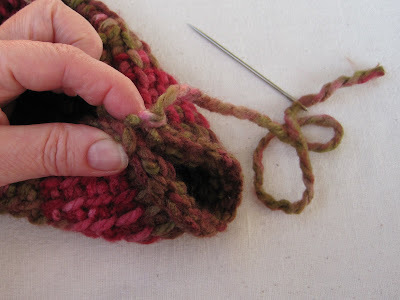 At toe end, using the long tail of yarn, sew the flap edge down with a shallow running stitch until you reach the tip. 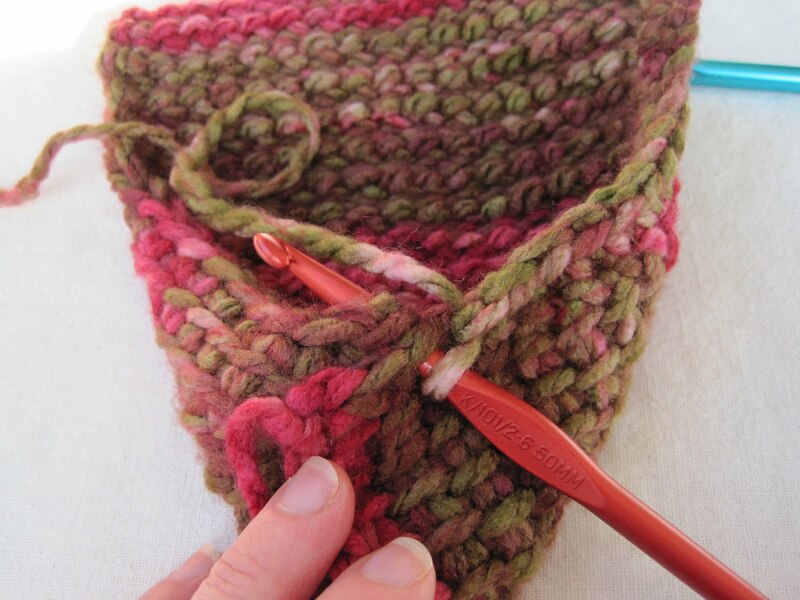 ...then bring the yarn around a stitch and back up through the tip to gently hold it closed. Do not pull too tightly. Keep your hand down inside the slipper to ensure that you don't accidentally sew through the space reserved for your toes. Pass yarn back into slipper fabric to hide end, secure, and trim. And you're done! What the Wisconsin Blogger is Wearing This Winter. Or make a pair for someone else, and share the enjoyment. This pair is a gift for a dear friend. You may do whatever you like with the slippers you make from this pattern, but you may not sell the pattern. If you have any questions, feel free to use the comment space below, or contact me in Ravelry. Perfect, simple, classic! Thanks for sharing! The Goatmother is in love with the buttons on the first pair! They are a very nice color combinations as well! What an intriguing design, thanks for sharing! what a sweet pair of slippers- can't wait to try this design... thank you, Sue, for sharing this wonderful tutorial. Very Classy and Very Happy slippers. I will have to attempt the Tunisian stitch. I am a lefty, so it may take me a while. Thanks for such a generous tutorial. Very impressive, they look lovely. They'd be suitable for summer wear for me, our house is very draughty so in winter I wear sheepskin slippers which come up past my ankles otherwise I have very cold feet and start to complain a lot. By the way, I hardly ever call them "slippers" - "baffies" is the word we use in our house, and it seems more apt for my chunky footwear than "slippers" which suggests something far more elegant and refined. I am in love with these! The other day I almost bought myself a Tunisian hook as I can't find the one I had. Why do they remind me of Aladdin? Again, I am in love. I want to make some right now. Brilliant! If only I could crochet, she wails once again. 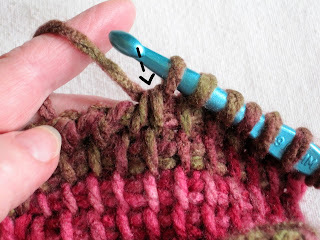 I've already knit my rectangles in seed stitch with LB Wool Ease Thick and Quick and just found a good contrast color to do the single crochet around edges (I can't crochet an object but I can do this & so can you! I promise!) I made mine very thick so that lovely pointed toe wouldn't collapse. I love these slippers!! Will be giving them to my sister and niece for xmas. Thanks so much for sharing!! I just know they will love them. These are so stylish! 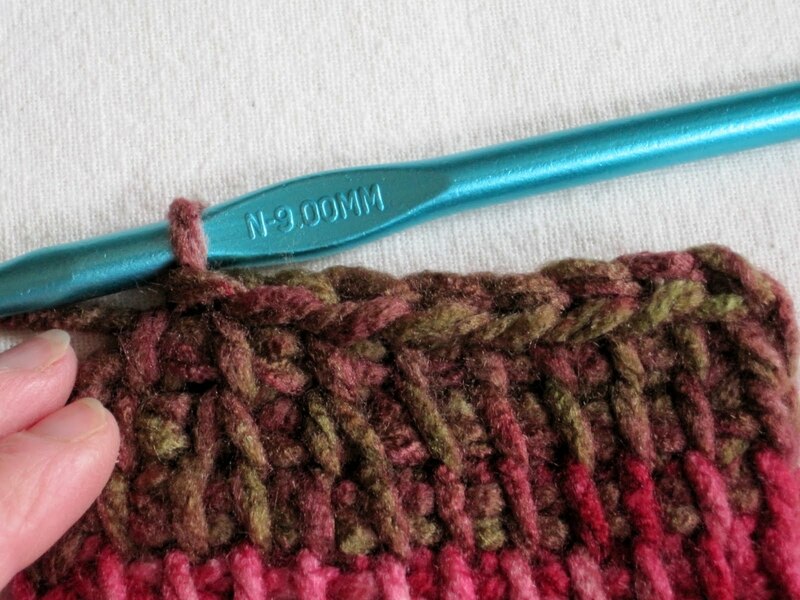 The Tunisian stitches should help them hold up for many long winters, too. What an incredible eye you have for design! This are awesome! I should probably try crochet one of this days. meravigliose, mi piacerebbe farle anche a me. I would make them immediately if I wouldn´t have such a lot of Ufo-socks. Charming is the only word! I have to make a pair. Thank you so much for sharing the pattern and the tutorial. Now... if I could just figure out how to make them into outdoor shoes, lol. I will knit a rectangle and make a pair since I don't crochet. They are just too cute! Thank you for the pattern. I have marked these for my next project. I have a couple skeins of mismatched WOOL 4-ply from a thrift store, which should work great and last forever. Thanks for making it simple. 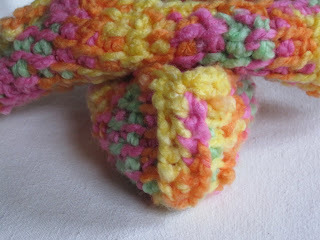 I am away from my stashes right now, so I have no buttons, but I will try some crocheted flowers. I just started a pair of these. Thank you for sharing this pattern. Thanks all! I really appreciate the kind feedback. Thank you for the wonderful pattern. The charity I crochet for will love these slippers. 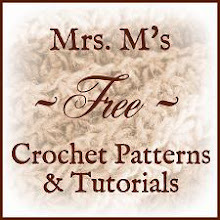 I will not share the pattern, but will share your URL. Do you think it would work to make them wrong-side out? I think I would like the bumpier side out and smoother side in. I decided I would just wear them inside out. :) but I can't seem to get the length/width right, too short and wide, too long and even wider...I'll keep adjusting. Ooh, just found you through Ravelry. Thank you loads for this lovely pattern, can't wait to get stuck in! Thanks Lorna! 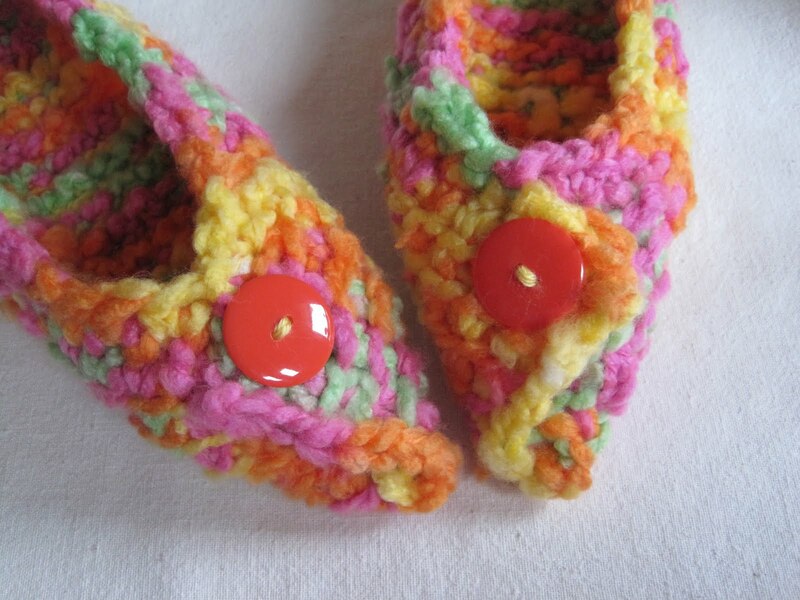 Hope you enjoy the slippers - be sure to post a pic on Ravelry when you finish them. But I think it's too dificult for me. I've got lost at the first row. Love that I can make this even without digging out my Tunisian crochet hooks! I just happen tto have a big batch of vanna's Colors Bulky which sells for $2 a 101 yd ball at Ac Moore! Slippers for everyone!!! You're welcome, Mrs. B. Thanks so much for commenting. Adorable slippers and so fast! A great stash-buster too. Thanks so much for sharing! Sure, any stitch will work. Good luck! Hi Sue - I'm Sue too. Had to start straight away! Never done tunisian crochet before but I am getting the hang of it. They are very stylish for hand made slippers. They remind me of Aladdin too. Good luck! They really go very quickly, I think. And thanks. MRS MICAWBER NAO SEI O QUE ESTÁ ESCRITO. DESCULPE A MINHA IGNORANCIA, SOU BRASILEIRA E NÃO SEI NADA DE INGLES, POR FAVOR ALGUEM PODE DECIFRAR PRA MIM? MEU E-MAIL E: laurafonasci@gmail.com. ABRAÇOS. LAURA. Procurar um botão perto do topo da página,no lado direito. Ele diz: "Translate". Clique no botão e escolha a opção "Português". Boa sorte! These are so adorable! I bet they are very warm. Would they be as warm as sheepskin slippers? Great pictures and tutorial! Thanks so much, all the girls are getting these for Christmas! I've never used Tunisian stitch in a pattern; I'm not really crazy about it. But these are great, I love the way you styled them. I think I might have to make them! 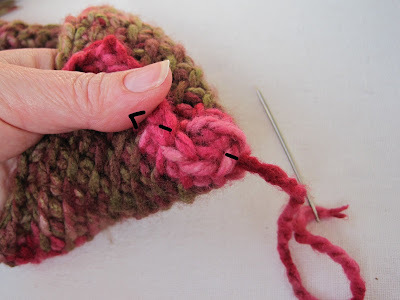 You can use any stitch you like, you know - just make a rectangle and go from there. 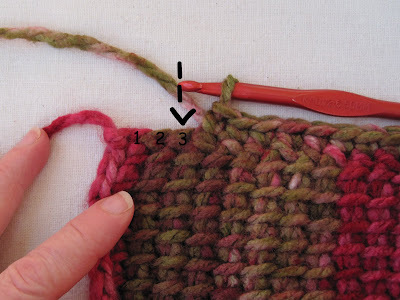 Many people on Ravelry have found that this pattern works best if you make the rectangle only as long as your foot (not longer, as I advised). This helps keep the slipper from falling off when it gets a little stretched out. I love these slippers! Where can we find the yarn that you used,I love the colors. Thank you for sharing these. I got the yarn at JoAnn Fabrics, last year (2011). I think it's probably still available. 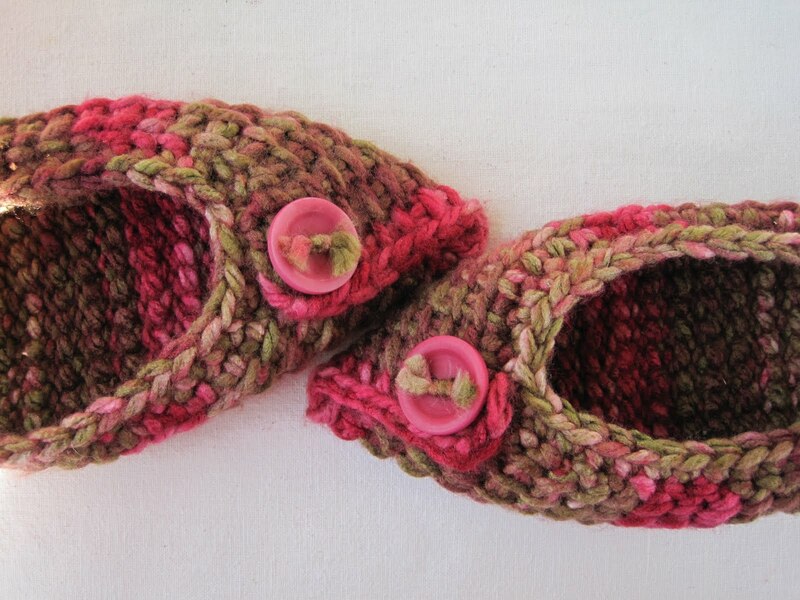 I am attempting these slippers right now! The patters in very classy. 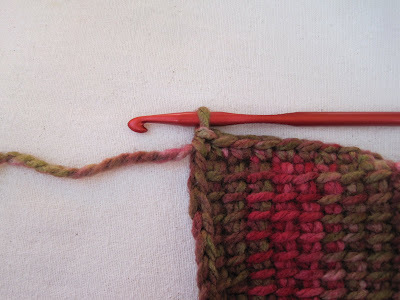 I think I am going to use a cro-hook in the future simply for the ease of keeping the stitches on my hook. Thank you! 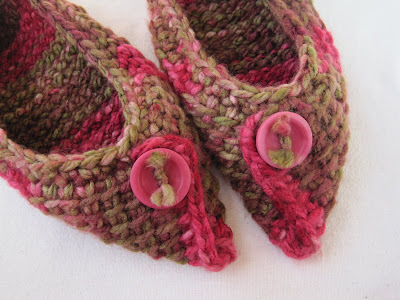 These are the most brilliant slipper pattern I have viewed and I've looked at many. I would like to try knitting them, as you said that it was possible to do so. Thank you so much for sharing this timeless slipper! Such an easy and fun project! Your directions are very clear and the pictures are great! I can't believe you got both of this done in less than a hour. This is the first time i have tried this pattern, and i'm going to suggest to all . Sure - just knit a rectangle, using any stitch you like, and following the directions above (under "Size") for dimensions. 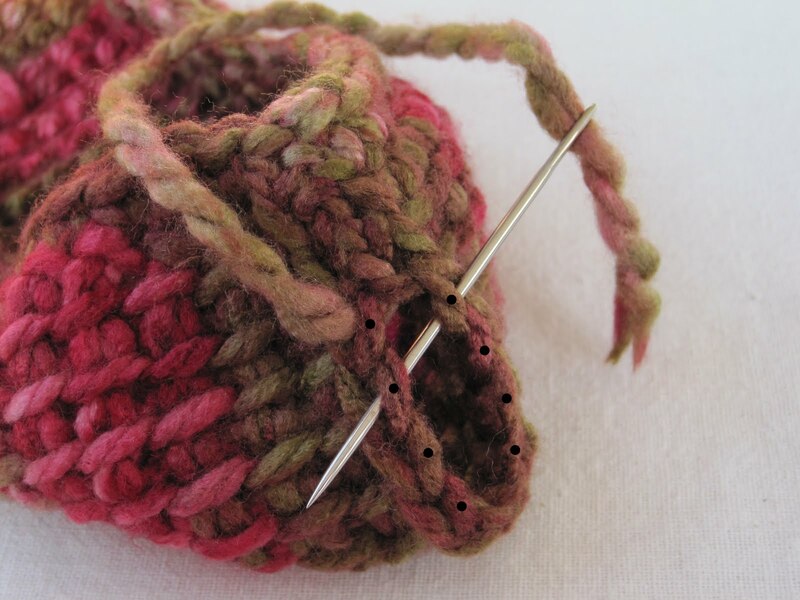 I would choose a stable stitch and use firm tension to prevent stretching. On your last row, decrease a few stitches to help the heel round up slightly. For the border - you would have to use your best judgement. You could try a simple knitted border after the rectangle is done, or you could work the border as you go - perhaps a couple of seed stitches or garter stitches at the beginning and end of each row? I did tight seed stitch. Bought a contrasting color today to do the simple crochet border (I'm not a crocheter either but I can do this. ) I love this. Oh, and I'm going to make a Pom Pom out of contrast to put on toes. These are beautiful. Thank you so much for sharing your patterns. I have lots of brown wool, so may try a pair with that and a pretty wine-colored variegate for contrast for thickness. I will have to look you up on Ravelry too. This is just a precious pattern. Thank you for sharing it. I'm so glad to find this before Christmas! A classic simple and elegant solution for chilled toes in Florida. Any suggestions on how to round the toes for a mens pattern? I have added this as a plan for extra gift for all of the family on my list. This is one example of tunisian density being perfect for the item. TY sooo much. Lovely website terrific patterns! BTW link to shoe measurements is awesome!